IT’S HERE! And just in time for Christmas! The first featured recipe video from DREMC’s Holiday Foods Collection, the delicious Strawberry Buttercream Cake is now on Facebook and YouTube! This three-layered cake is perfect for the holidays and any special occasion. 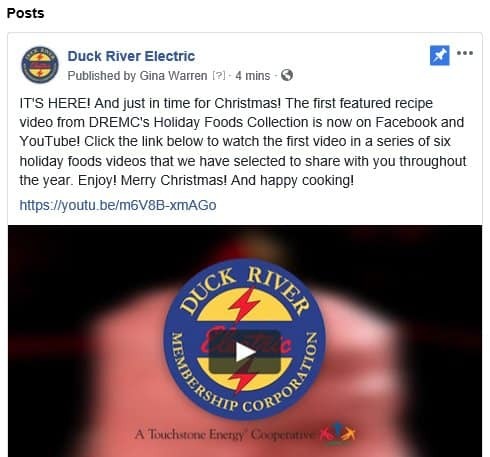 Just visit DREMC on social media, and click the link or play button to watch the recipe production. The Strawberry Buttercream Cake is the first in a series of six holiday foods videos that we have selected to share with you throughout the year. If you like this one, be sure to check back around Easter for our next Holiday Foods recipe debut! While you’re on DREMC’s Facebook page, please be sure to like, follow and share us on social media. Enjoy! Merry Christmas! And happy cooking! Look for the Strawberry Buttercream Cake recipe video on Facebook and YouTube.